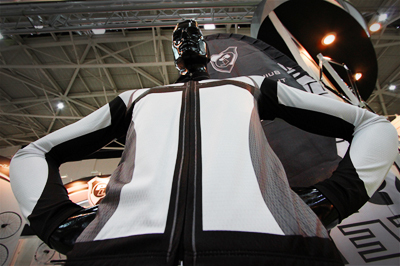 March is the month of the Taipei Cycle Show, one of the most important events in the global cycle industry. It's also one of the most exciting times of the year and it's always fun to share key highlights. If you would like to see more of our pictures from the show, please jump over to our facebook album. Sadly, just prior to the show, tragedy struck in our neighbor to the North, Japan. The fear inspiring events that were unfolding there were on everyone's mind every day, and were often the first items in conversation. This flavoured the mood before, during and after the show, giving a reserved tone and a greatly diminished 'buzz'. Even still, there were some good things happening and good economic signs to be found all over the place. We found a huge upswing of interest in the China, Korea and Indonesia areas, which is certainly a sign of strengthening economies for these regions. - There were some really great bikes on display at the booth of our friends at Focus. Clever folk! - Always eyecatching was the Nicolai booth, which also displayed some downright sweet offerings at Rotor's section on the side. - Gorgeous new product from the brilliant minds at Ergon, especially with some of their 'yet to be released' grips and some very intriguing new pedals as well. Sometimes it's rewarding just to come face to face with the guy behind something awesome and say "Thanks! Your stuff rocks!" We were very sad to see an empty booth at RaceFace 2 aisles over from ours. RIP RaceFace and best wishes to the boys from New Westminster in your future endeavors. - On the first day, there was a party held by the organizers of the show. Although it took a little while to get going, things really warmed up with some phenomenal vocals of a local party band that plays regularly at the Taipei bar "China Pa", doing everything from great male falsetto covers, right down to a stunning impression of Stevie Nicks. It was tough to overcome the dampened spirits in the wake of tragedy, but between the music and the 'free flow of drinks', a good time was the result. Good job TAITRA! - We at Pro-Lite were honored and grateful to Allan for a pleasant evening with some great folks down at the DTC dinner. 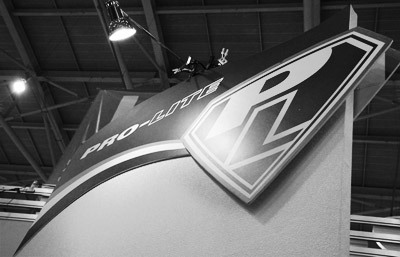 Down at the Pro-Lite Booth, there were always lots of things happening with our emphasis on keeping an open and friendly atmosphere, with direct competitors and friends alike dropping by for a quick chat, maybe a drink or two and a chance to take a load off. Whether it was getting some practical advice on manufacturing special tubing for belt drive bikes, helping racers figure out their ideal rim profile or working out spec for special OEM setups for some Power Players from Italy, we all had a great time brainstorming, advising, listening and reminiscing. - A Japanese company that manufactures parts for jet engine turbines came to us looking for the "very best rim" and "very best spokes" that could possibly be found. We understood a bit more about where they were going with things when they pulled their product out of their bag. Their very first prototype model of an Ultra-Boutique hub... $1800 US wholesale. Smooth like glass, it was clear that they had put their considerable resources into producing something with exceptional quality. 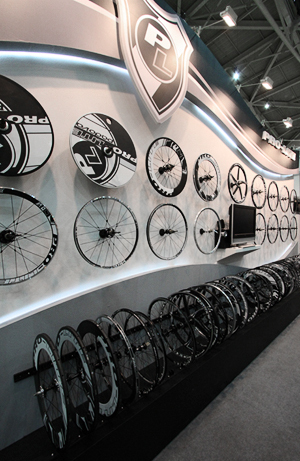 We were pretty proud when we handed them the Bracciano and Rosa wheels and let them feel. They spent about 5 minutes quietly spinning and feeling and chatting back and forth in Japanese before they said "Mmmm, yes, these are very, very good". There was no financial benefit for us, but we were happy to let them sit down and examine some of the 70 odd wheelsets we had on display and they were visibly surprised at how smooth they all were. It was a lot of fun and we welcome them back. - A couple of French Pro riders came by and checked out our newly designed, but still being tested, Bracciano C50T Carbon wheelset and actually didn't believe the weight we had listed. It turned out that they actually had 3 digital scales between the 2 of them and they had to eat their skeptical words as their total came in at actually 30 grams lighter than what we had come up with just two nights previously in the office. Backed by the same quality that has made the Bracciano such an outstanding player in the market, they had to come to the conclusion that we had actually succeeded in building a wheel that was both ridiculously light AND strong enough to handle tall, high-torque riders. Discriminating taste: Oh Yeah! With the frenzied activity of the Show over, everything is now refocusing on the next major industry event in Taiwan, TBW. Enthusiasm for the event keeps growing, with the little event now a hot topic even at the very highest levels of industry.